Which, of course, is exactly why I was drawn to it for my second trip with Viking River Cruises. After exploring Christmas markets along the Rhine with Viking last year, I knew I wanted to showcase one of their non-Western-Europe cruises this time around. Even though river cruising isn't exactly “off the beaten path,” I liked the idea of cruising somewhere that many people probably haven't even considered. 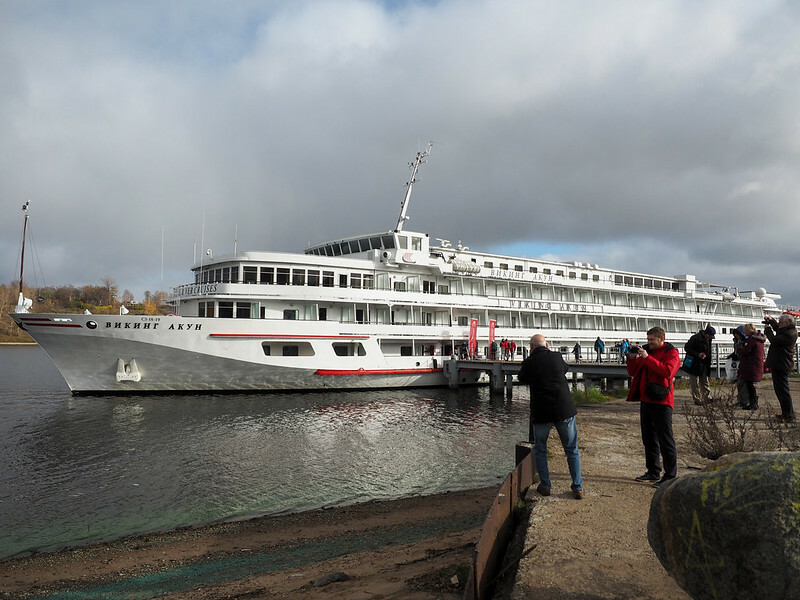 So I chose Viking's “Waterways of the Tsars” cruise from Moscow to St. Petersburg. While this 13-day cruise was similar to other river cruises I've been on in many ways (the very nice staterooms, the fantastic service, the great included tours and excursions), it was different in other ways. Firstly, we spent several days docked in both Moscow and St. Petersburg instead of just passing through. And we sailed not only up the Volga River, but also through some of Europe's largest lakes. There was still A LOT packed into just 13 days, though. Lots of cathedrals and palaces and kremlins and more churches. I'll be writing a bit more about the cruise itself later, but for now I just wanted to share the highlights. The one place in Russia that's always been on my bucket list was Red Square so I could see the iconic St. Basil's Cathedral in person. And the reality was even more breath-taking than I ever thought it would be. This was partially because Red Square is HUGE. It's definitely not your average square, covering nearly 800,000 square feet! St. Basil's is on the far end, with the State Historical Museum on the opposite end. 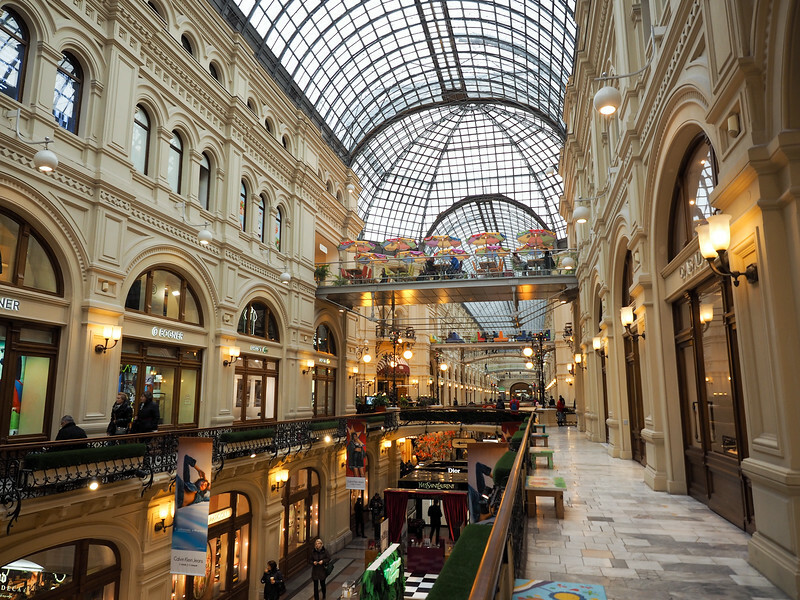 On one side you have GUM, (now a high-end department store), with the walls of the Kremlin and Lenin's tomb on the other side. 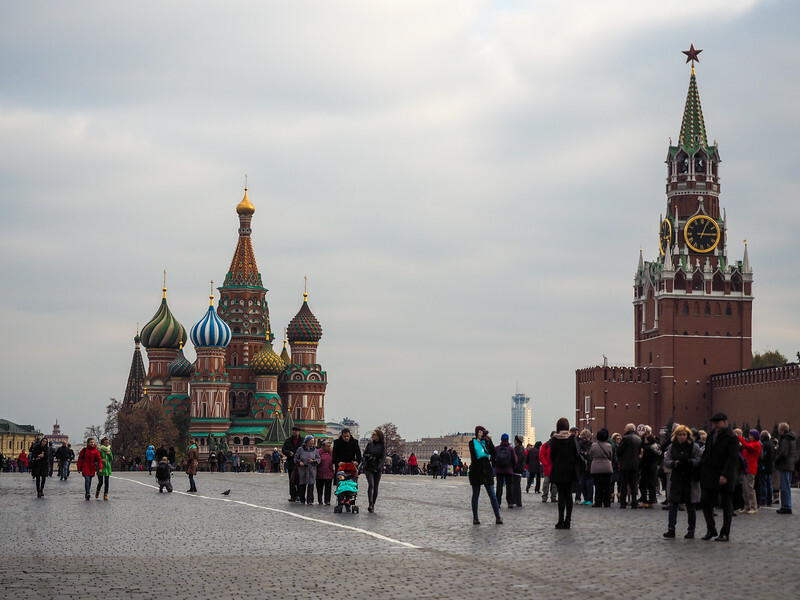 Less than half of Red Square is in this photo – it's huge! I was also surprised by all the other buildings on Red Square that I didn't really even know about, but that were equally impressive. 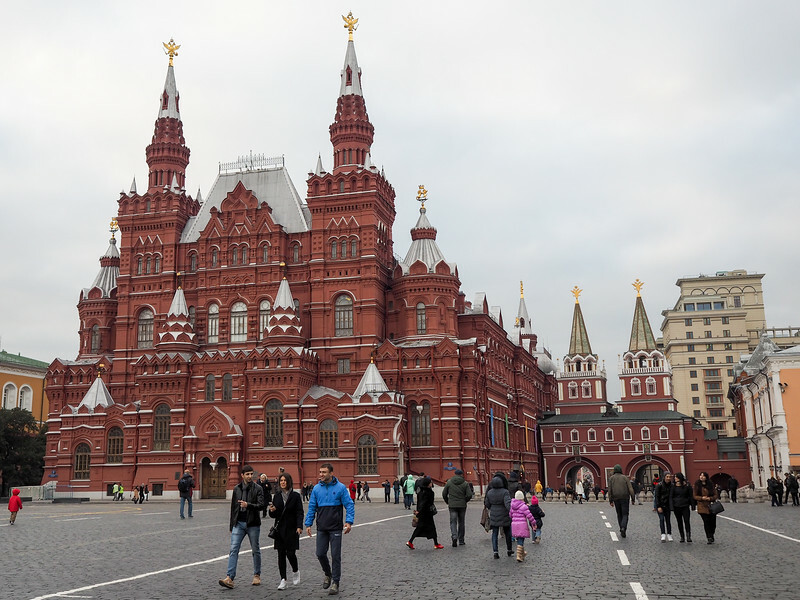 Many people think that Red Square is named for the red walls of the Kremlin, or perhaps because of the violence that has taken place there in Russia's past. But “red” is actually just synonymous with “beautiful” in Russian – meaning it's really just the “Beautiful Square.” I don't think I can really argue. 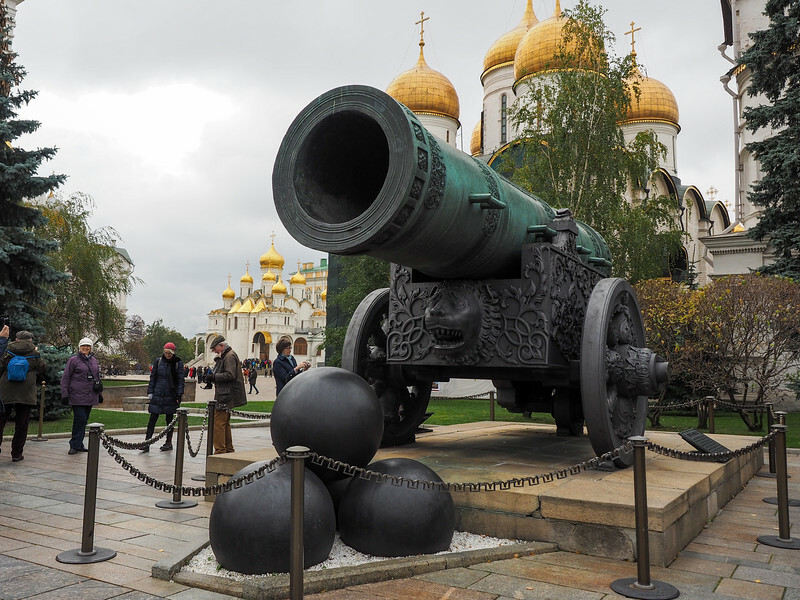 I also got the chance to tour part of the Kremlin while in Moscow, including its Cathedral Square (yes, the Kremlin has like seven churches within its walls), the massive Tsar Cannon and Bell, and the Armory (which is where some of the most opulent state treasures are kept). I originally wasn't even signed up to visit the Armory, but ended up going anyway. And even though our tour was a bit rushed and you couldn't take photos inside, it was staggering to see so many lavish things in one place. Moscow is pretty impressive by day, but it absolutely shines (literally) at night. 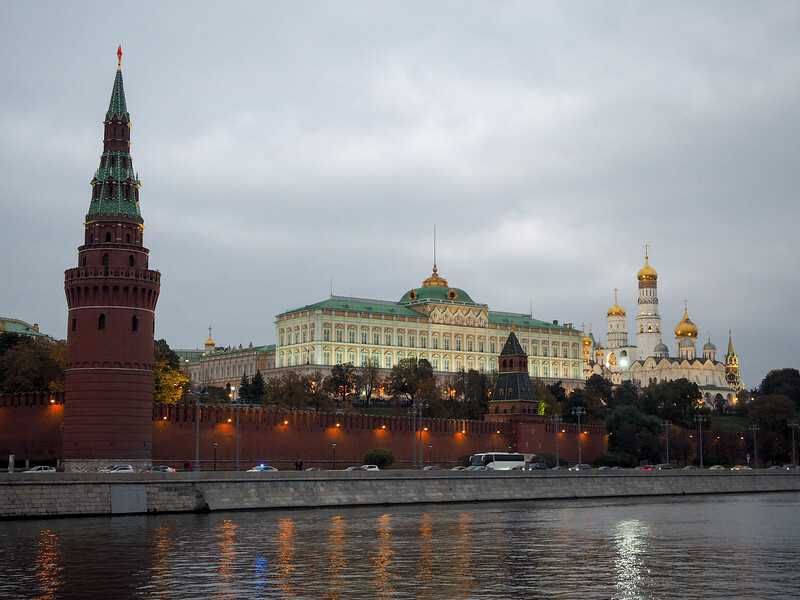 We bundled up and took a cruise along the Moskva River, drifting past the illuminated Kremlin and other buildings around Moscow. Afterwards, we headed to see Red Square at night. It was after 11 p.m. in October, meaning it was very dark and quite cold – but the square was also almost empty. And everything here is illuminated at night, from St. Basil's Cathedral to the massive GUM department store. As I wandered in circles taking it all in, I couldn't help but wonder how much the city spends on its electric bill in order to do this every single night. It didn't take very long for me to realize something about Russia: religion is extremely important here. I'm not sure why this was so surprising to me (maybe from the knowledge that religion was banned during the Soviet years? ), but I was absolutely blown away by all the beautiful churches, cathedrals, and monasteries that we saw. 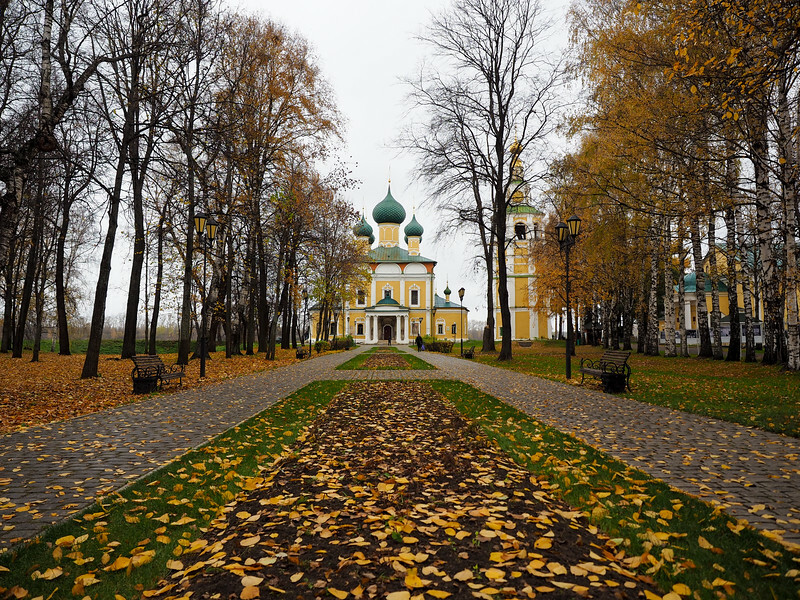 The most impressive monastery by far was the Trinity Lavra of St. Sergius in Sergiev Posad. 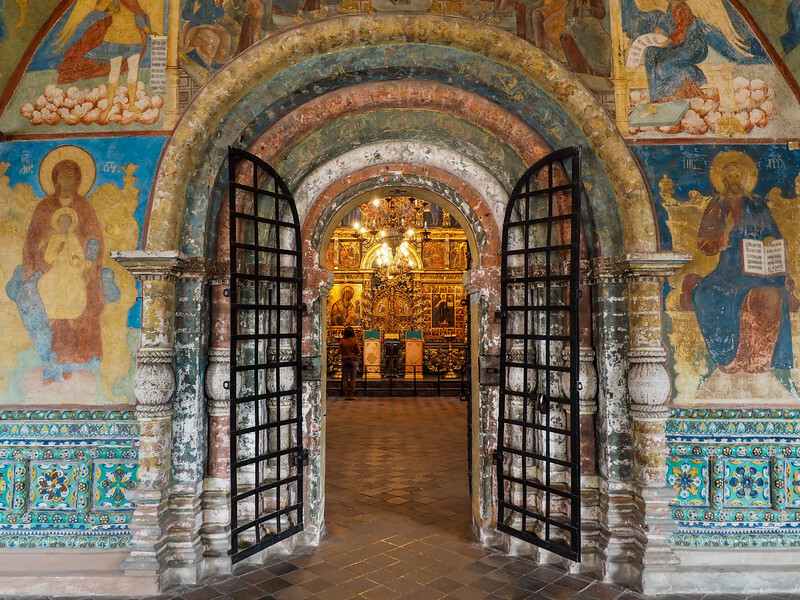 This monastery is considered to be the most important monastery in Russia and the spiritual centre of the Russian Orthodox Church. It dates back to the 1300s and is currently home to hundreds of monks. We spent a morning visiting the various churches and cathedrals of the monastery, each one seemingly more impressive than the last. 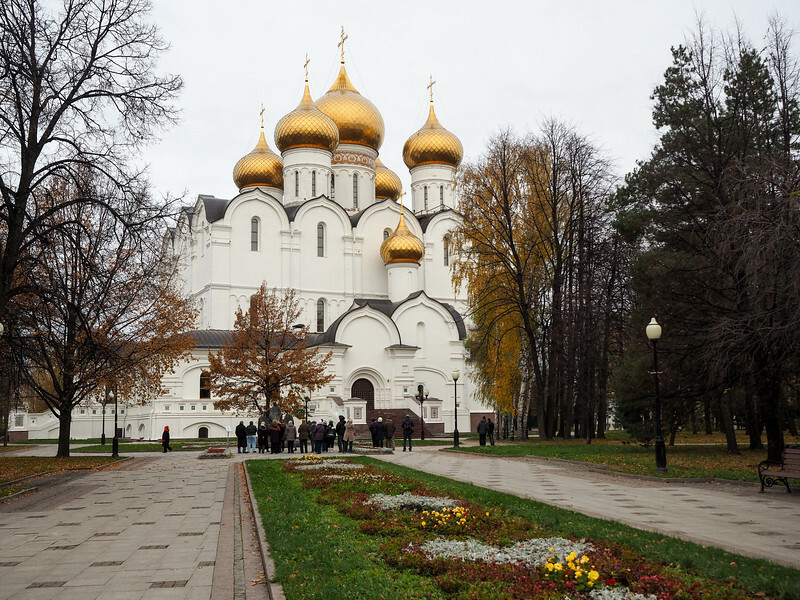 I didn't know much about Yaroslavl before I visited, but it turns out that the city (which dates back to the early 1000s) is part of Russia's “Golden Ring,” a group of historic cities that have played an important role in Russian history. We started our city tour by visiting a couple of cathedrals. 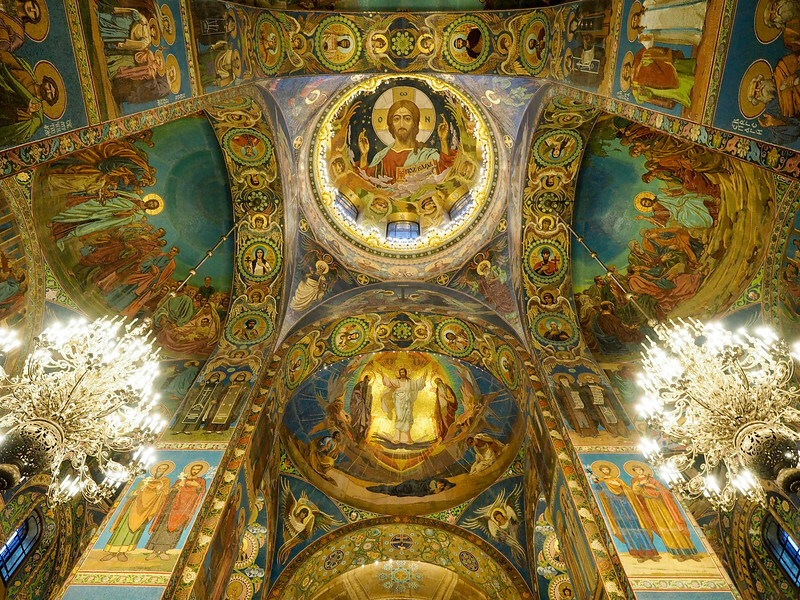 One – the Assumption Cathedral – was destroyed during the Soviet era and only rebuilt in the last 10 years, while another – the Church of Elijah the Prophet – was preserved with its 17th-century frescoes in-tact. 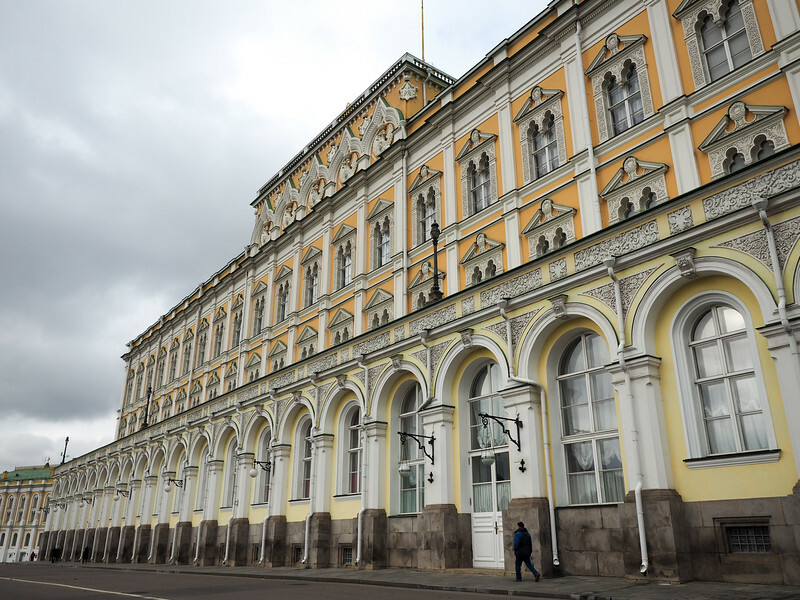 We also visited Yaroslavl's UNESCO-recognized city center, and rounded out the tour with a stop at the Governor's House, which is now a museum of art and Russian culture. 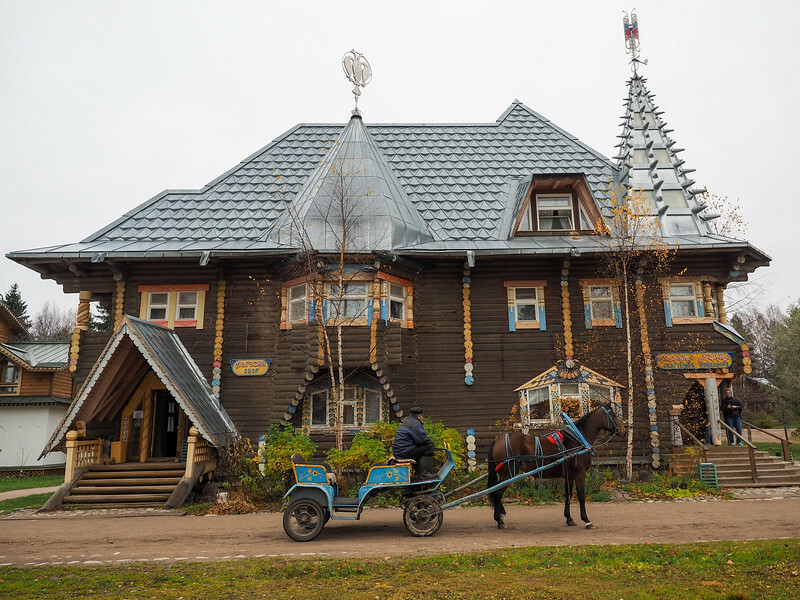 After sailing across Lake Onega (the second-largest lake in Europe), we arrived to Kizhi Island on a cold, gray afternoon with a threat of sleet. Normally this sort of weather would depress me, but I was so excited to explore this random little island that I didn't even care. 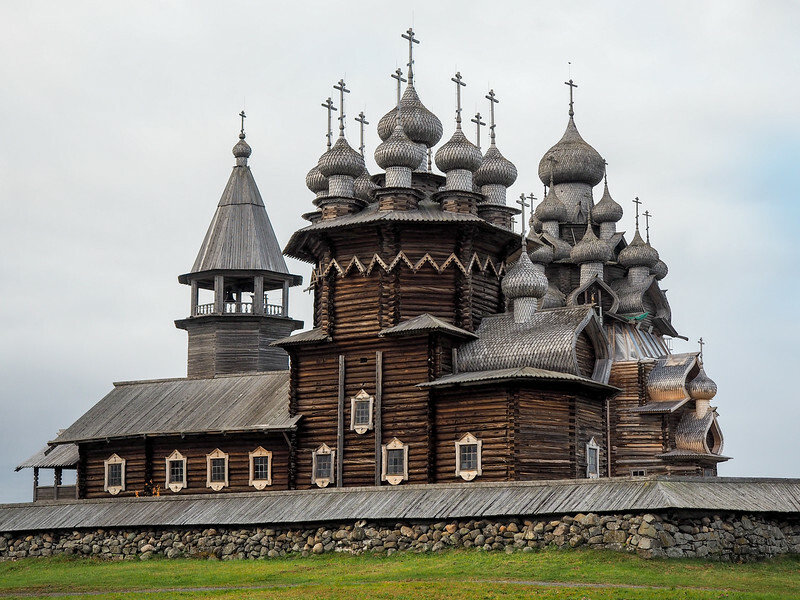 Kizhi Island is home to Kizhi Pogost, a fenced-in area that consists of two large 17th-century wooden churches and a bell tower. This might not sound that impressive on paper, but to see them is to be wowed. 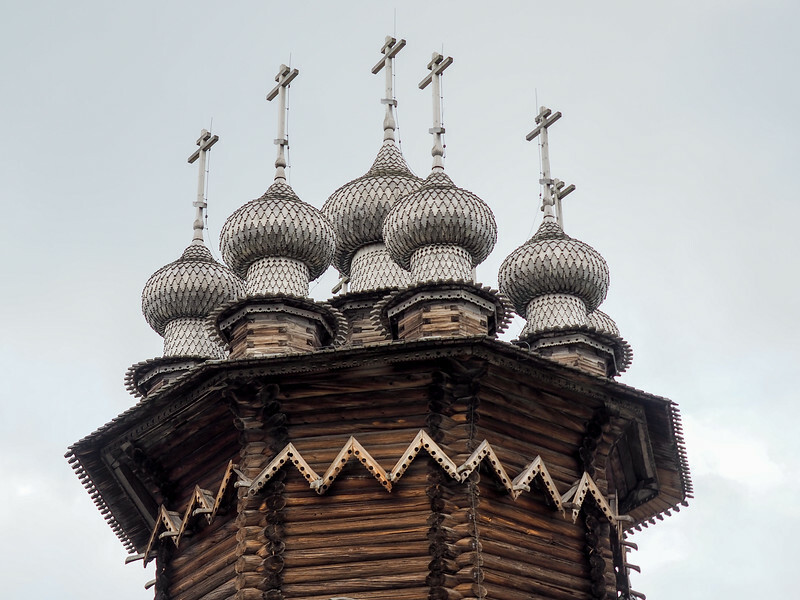 This is mostly because the intricate 22-dome Transfiguration Church and the 9-dome Intercession Church are constructed entirely of wood that fit together like puzzle pieces – not a single nail was used to build them. The story goes that when the architect finished the main Church of the Transfiguration, he tossed his axe into the lake because he declared he could never construct anything more beautiful. You'll find other wooden structures on the island in an open-air architectural museum, but it's really Kizhi Pogost that is the star here. 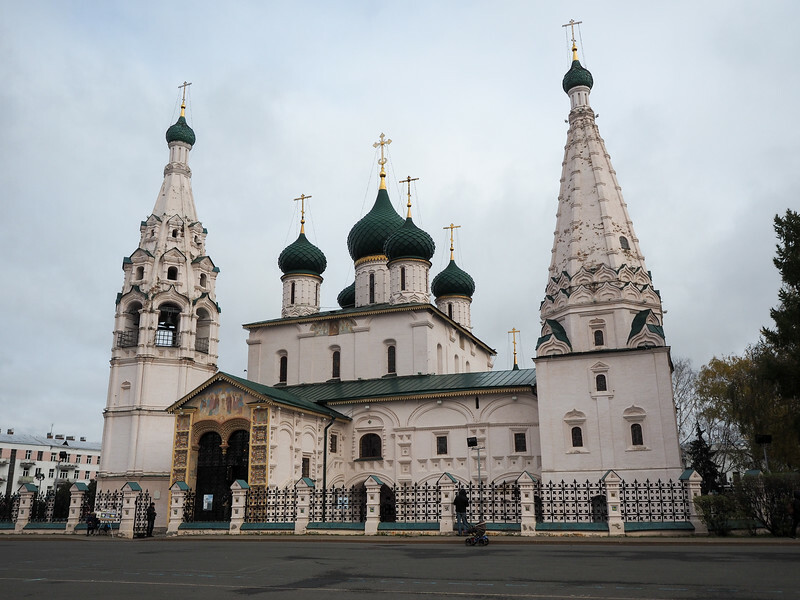 It's listed as both a Russian Cultural Heritage site and a UNESCO World Heritage site. Our last stop before reaching St. Petersburg was in a little town called Mandrogy. This cute little town used to be a real place where people lived, but all but disappeared after WWII. 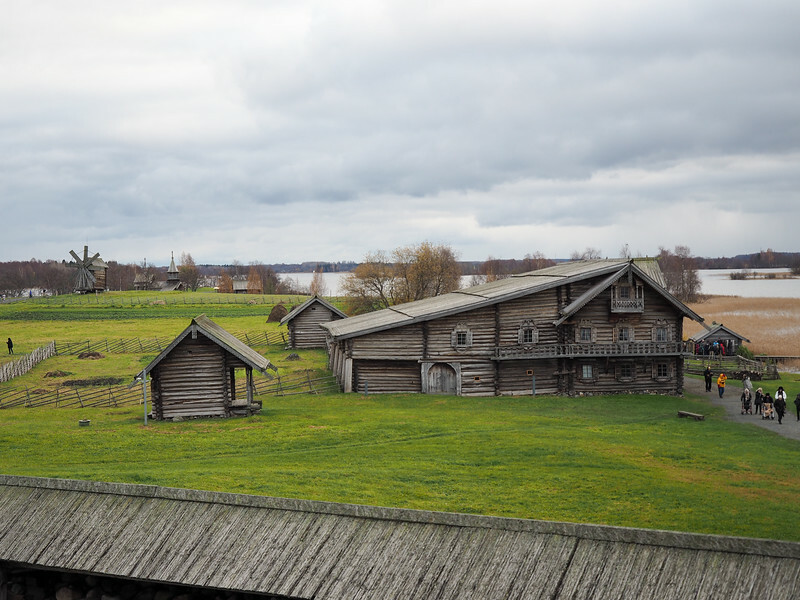 In 1996, though, a Russian man got the idea to reconstruct the town as an open-air museum representing traditional Russian villages solely for river cruise passengers to visit. 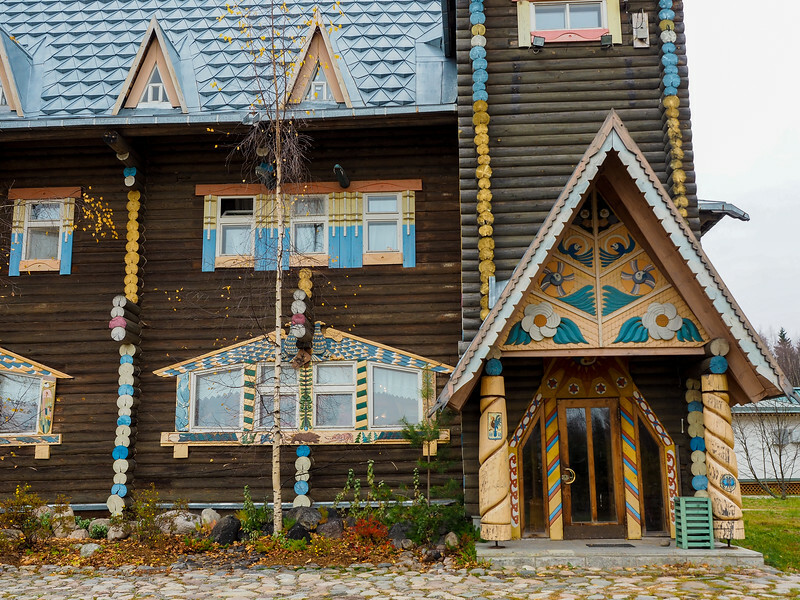 Today the town has handicraft workshops, a vodka museum, a cafe, a banya (Russian sauna), a zoo, and a collection of colorfully-painted log buildings. Mandrogy is by no means traditional (and I think it might actually be a nightmare in the busy summer months when lots of ships are visiting at the same time), but I actually kind of loved it in all its kitschy glory. 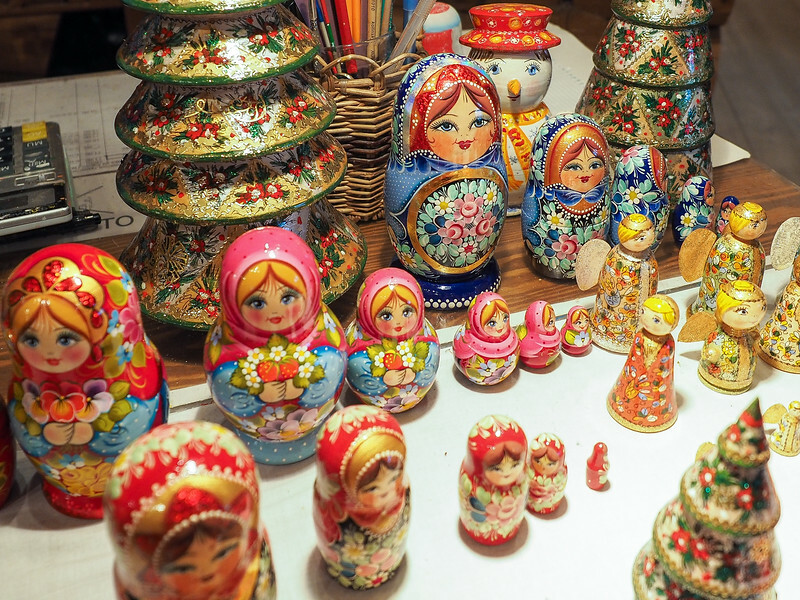 Mandrogy is also one of the best place to buy hand-painted matryoshka dolls and other Russian souvenirs, so be sure to save some of your rubles for this stop. St. Petersburg was our final stop on the cruise, and we spent three whole days in the city. 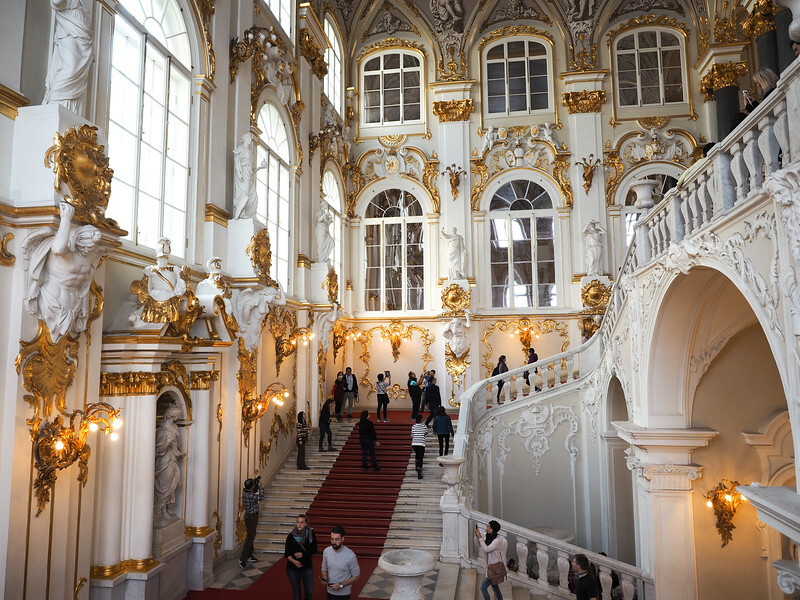 Our first stop was at the famous Hermitage Museum, which is partially located in the old Winter Palace of the Russian Tsars. 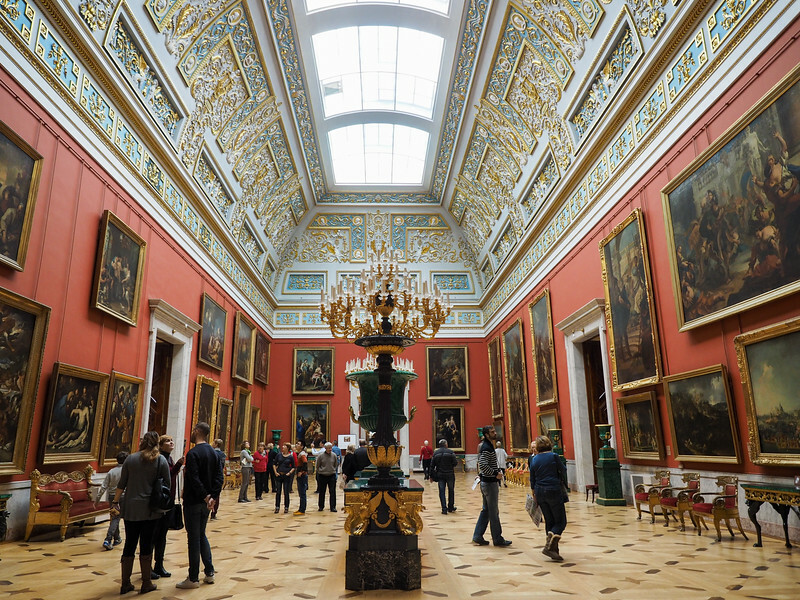 I'm not really a huge fan of art museums in general, so I wasn't sure that Hermitage tour would be able to keep my interest for a full four hours. But damn, was I wrong! The Hermitage is much more than just an art museum. I mean, yes, there's lots of artwork, including some by very famous artists. 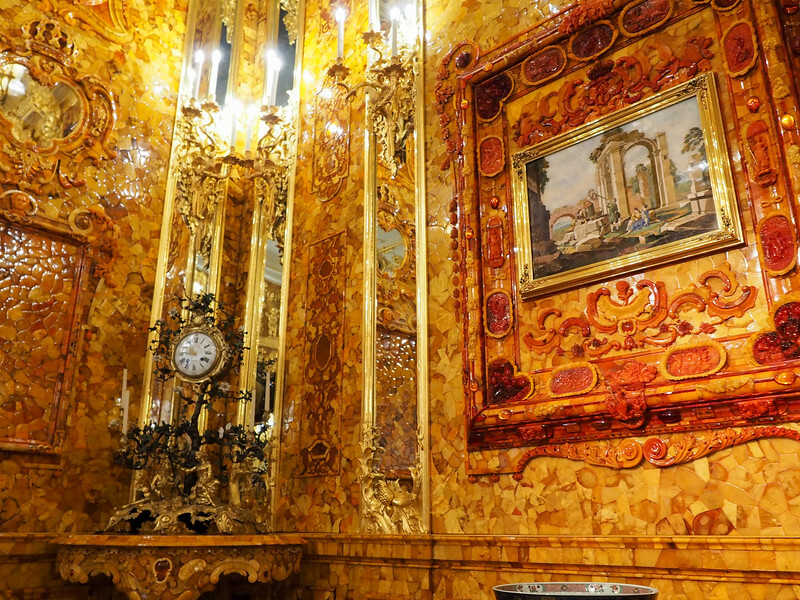 But the real draw (for me, at least), were the opulent rooms of the former Winter Palace. 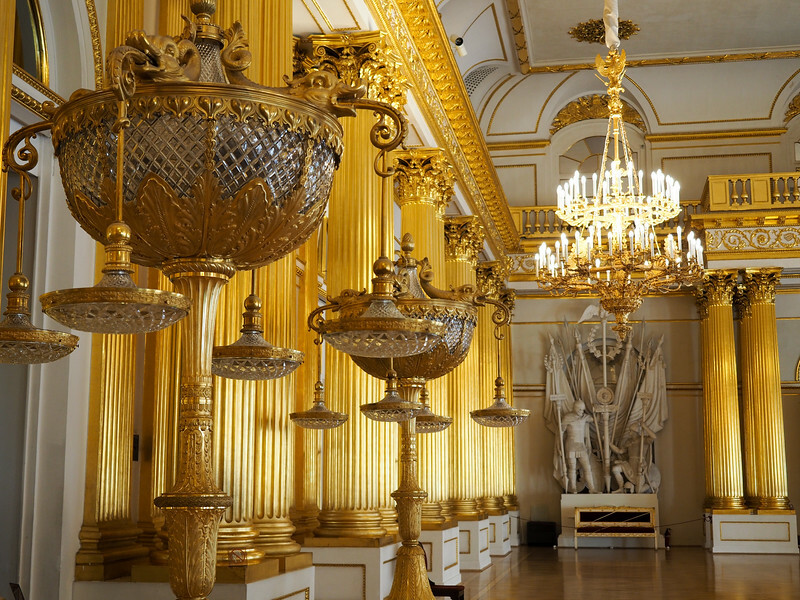 Walking through these rooms had me absolutely enthralled – and later in the evening we even got to see a ballet performance of Swan Lake in the Hermitage Theater (formerly the private theater of the Tsar). This is an absolute MUST in St. Petersburg. 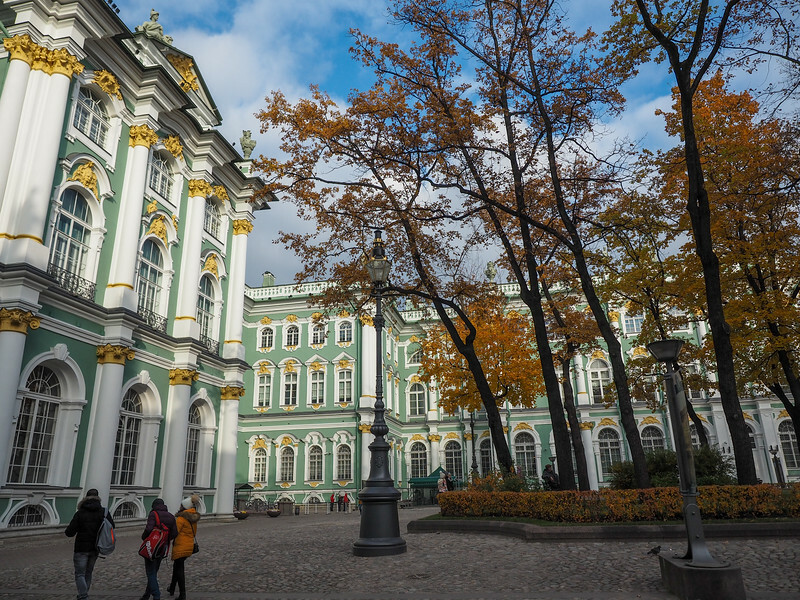 Afterwards, I went wandering around St. Petersburg on my own, with my first stop being Palace Square to take even more photos of the beautiful Winter Palace. Even though I spent four hours at the Hermitage, I barely even scratched the surface. Having a guide was crucial, though – it ensured we saw all the best parts and most notable works of art in the time that we had. You would think that after a week and a half of LOTS of cathedrals that I would have been churched-out by the end of this cruise. But you know what? I really wasn't! 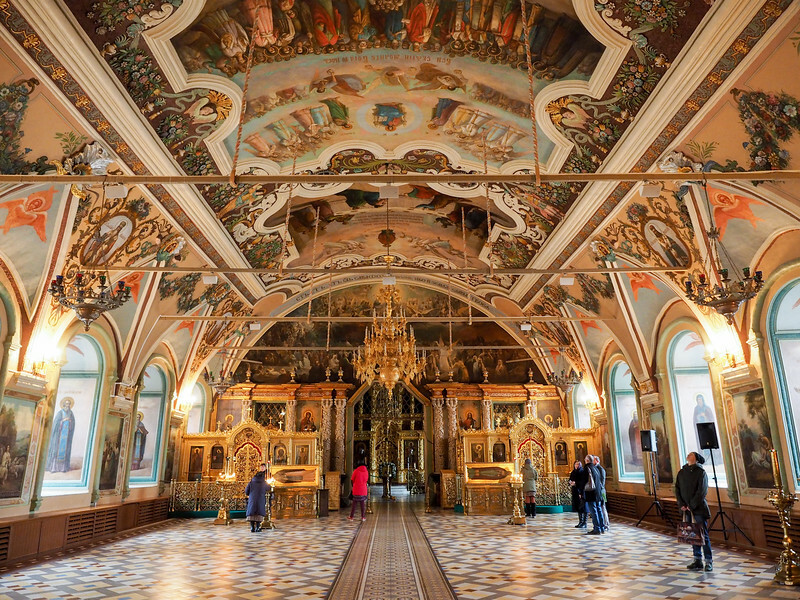 I think it's mostly because Russian Orthodox churches (and especially the ones we visited) are so beautiful and ornately decorated on the inside that it's really difficult to get bored of them. I visited one more church with a Viking group, and it was definitely one of the best: The Church of Our Savior on Spilled Blood. This church was built on the exact site where Emperor Alexander II was assassinated in 1881, and no expense was spared. The outside of the church is extremely eye-catching, and inside the entire thing is covered in mosaics. 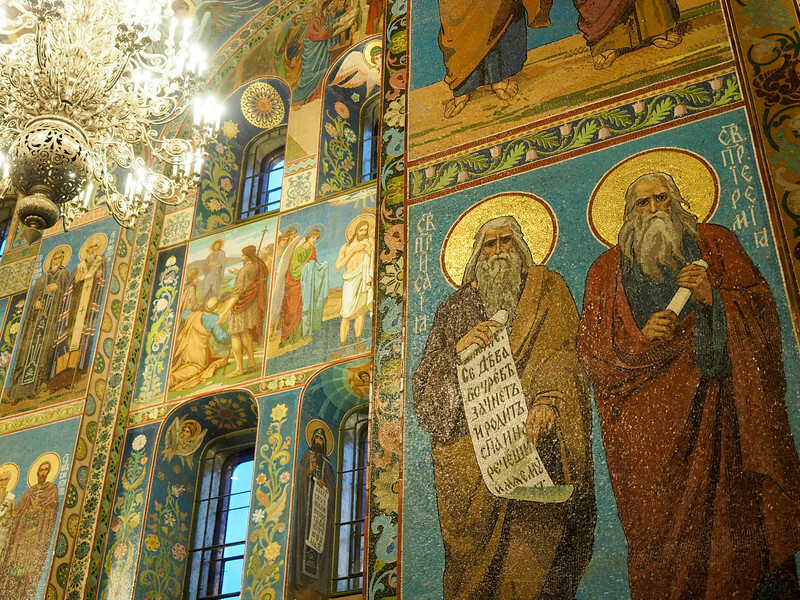 Restoration of the mosaics is ongoing, but I'm just so glad that this one survived the Bolsheviks and wasn't destroyed. 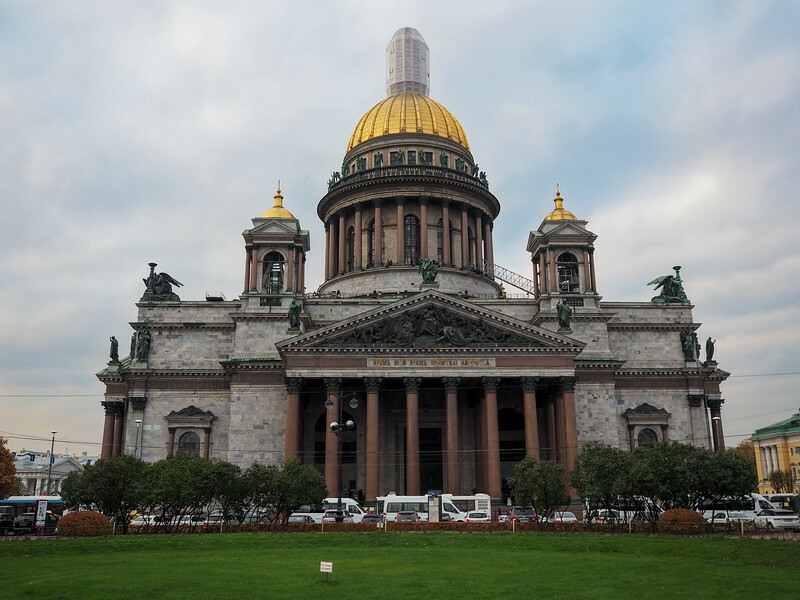 I visited St. Petersburg's other famous church on my own during a free afternoon in the city: St. Isaac's Cathedral. …but it's one of the most beautiful on the inside. 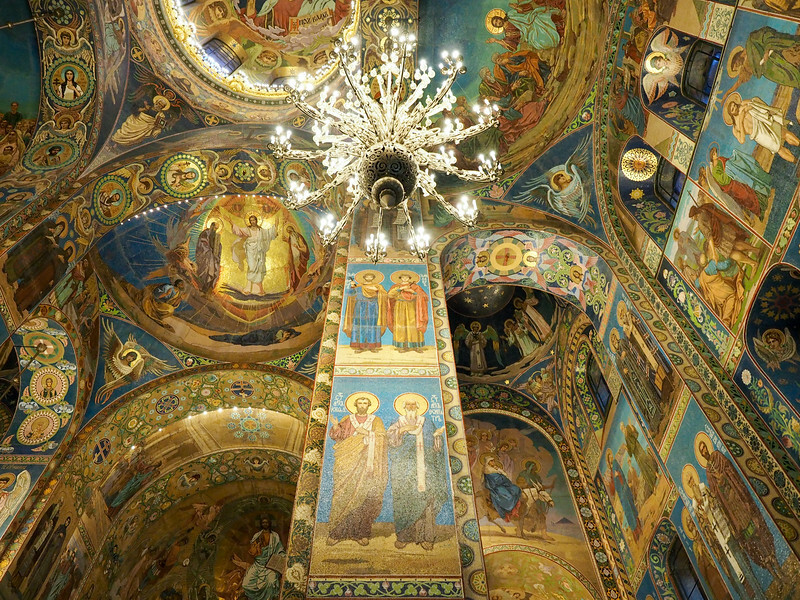 Inside St. Isaac's, the walls and ceiling are covered with mosaic icons, detailed paintings and columns made of malachite and lapis lazuli. I honestly spent nearly an hour inside, just admiring everything (and that was after more than 10 straight days of churches and cathedrals, remember!). 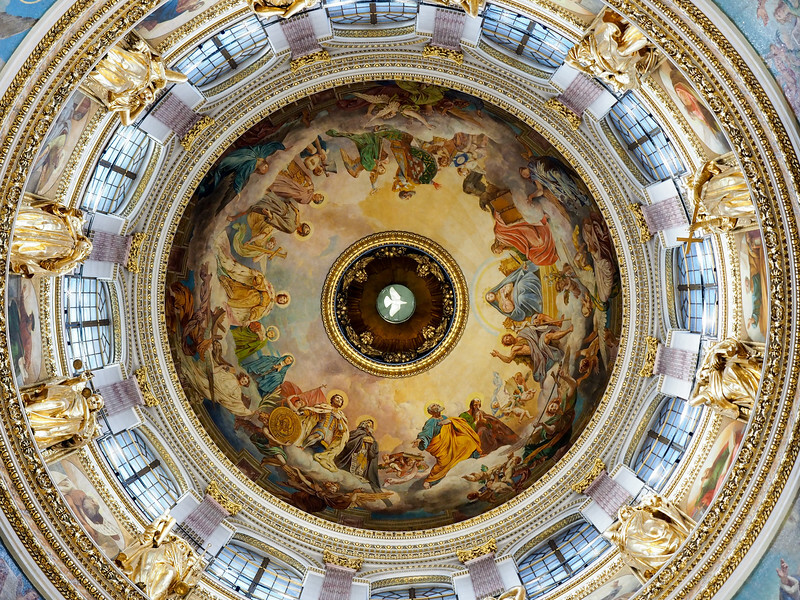 The dome is my favorite part, with an image of a white dove in the very center that you could easily miss if you didn't know to look for it. 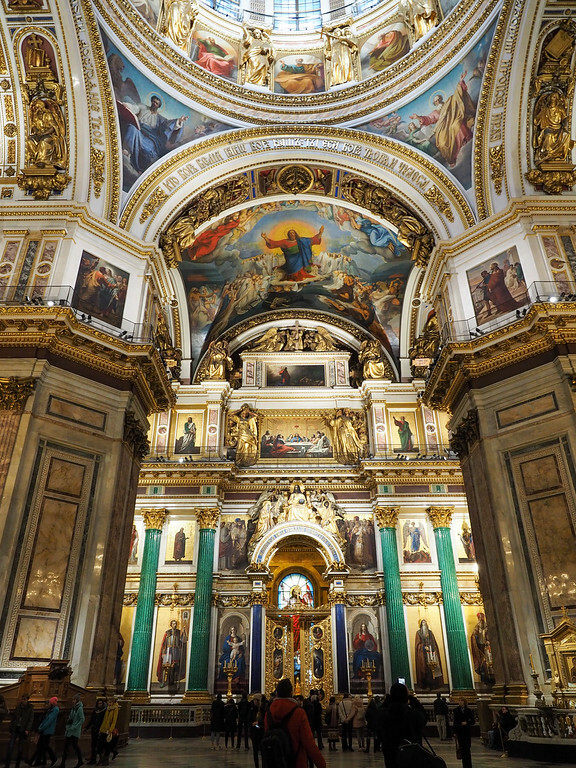 St. Isaac's was closed in the 1930s (along with most churches in Russia), and reopened as a museum, which it remains today. I highly encourage visiting this one on your own (it's not included in any of Viking's tours), and also recommend climbing up to the Colonnade for great views out over St. Petersburg. 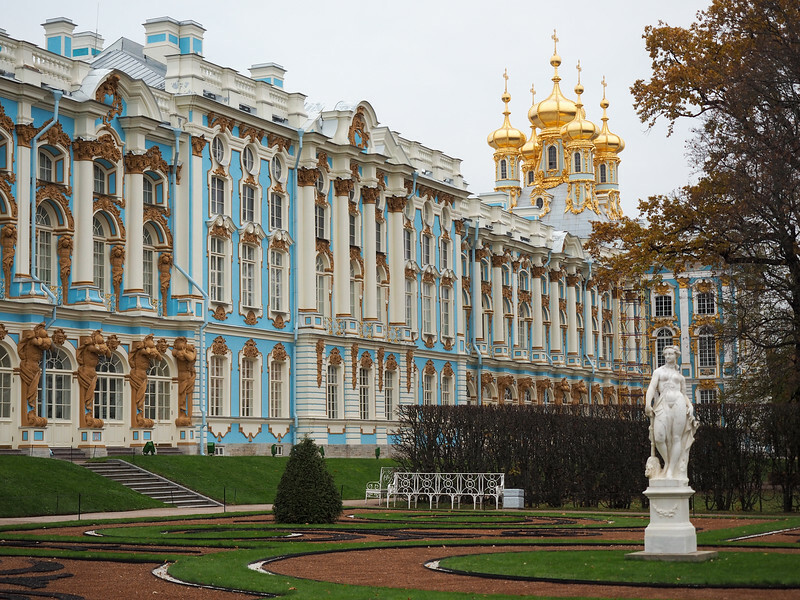 I took a few short trips outside of St. Petersburg with Viking, too, including to Catherine Palace and Peterhof Palace, both built during the time of Peter the Great. 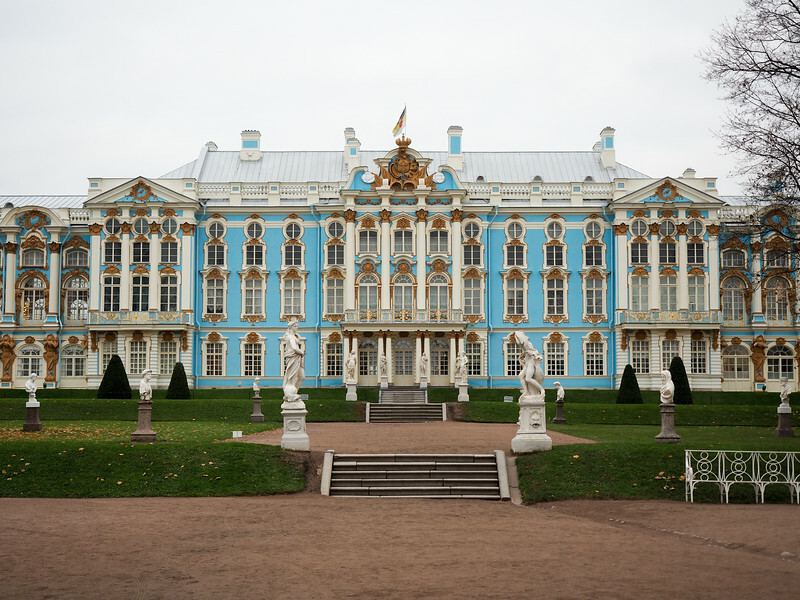 We visited Catherine Palace first, which is striking with its blue exterior and sprawling gardens. The palace was built for Peter's second wife, Catherine I, and was originally much smaller and less opulent on the inside. But daughter (and later Empress) Elizabeth expanded the palace and made it grand and lavish. 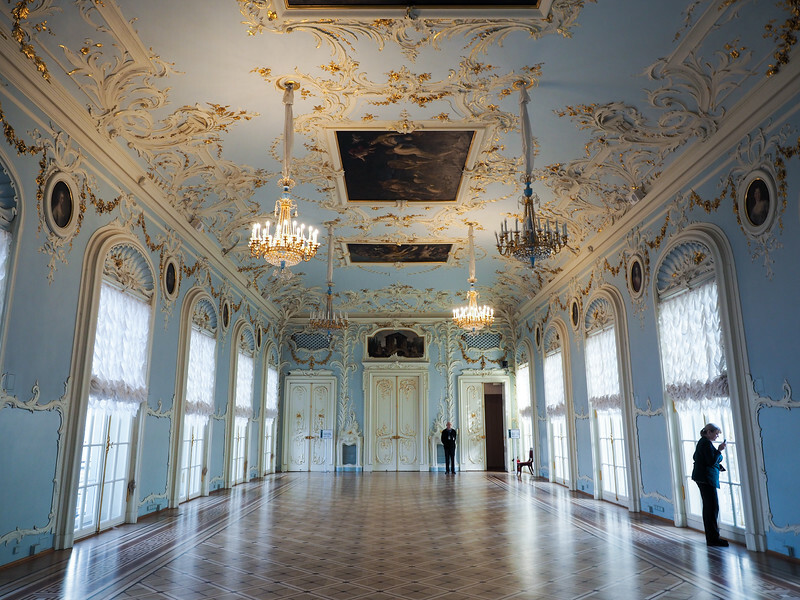 Sadly the palace was reduced to rubble during WWII, but has since been painstakingly restored. 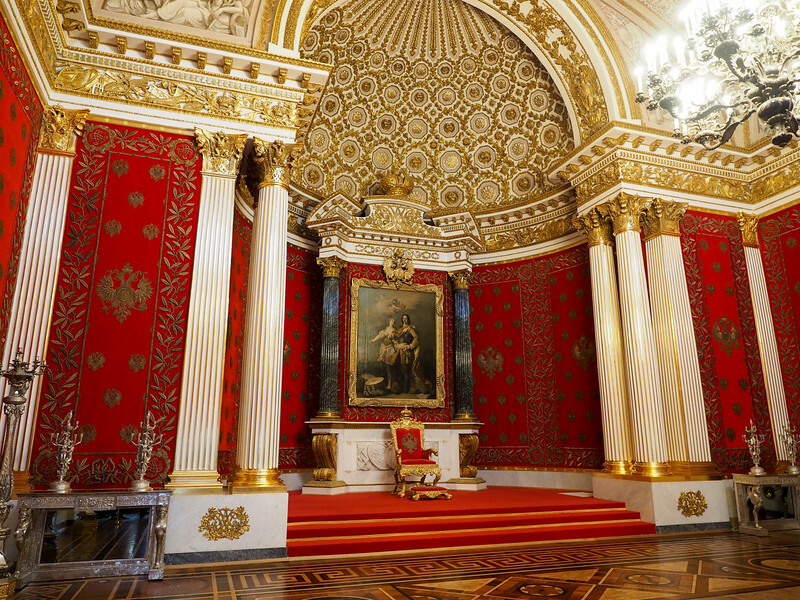 While I was impressed by the golden Great Hall and the Amber Room of Catherine Palace, it felt really crowded (and also didn't really hold a candle to the Winter Palace). 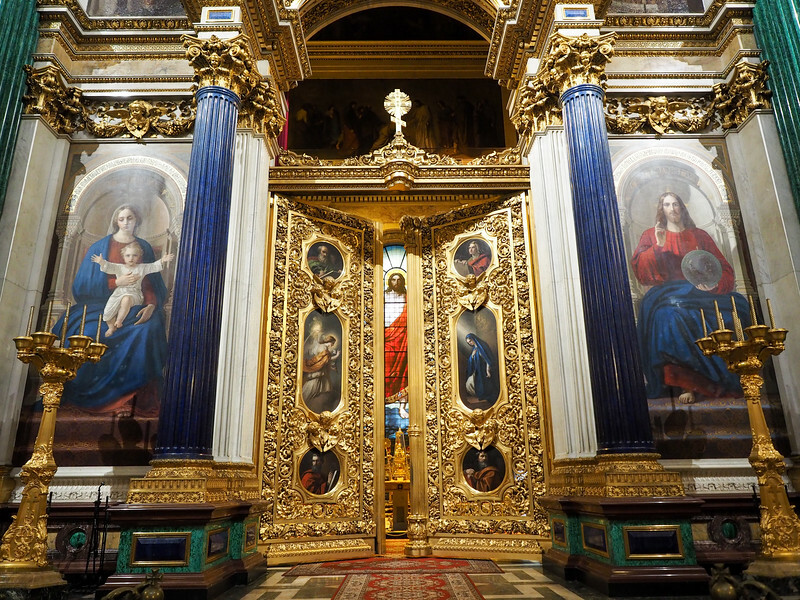 I would still recommend visiting, but I would maybe do it before going to the Hermitage! 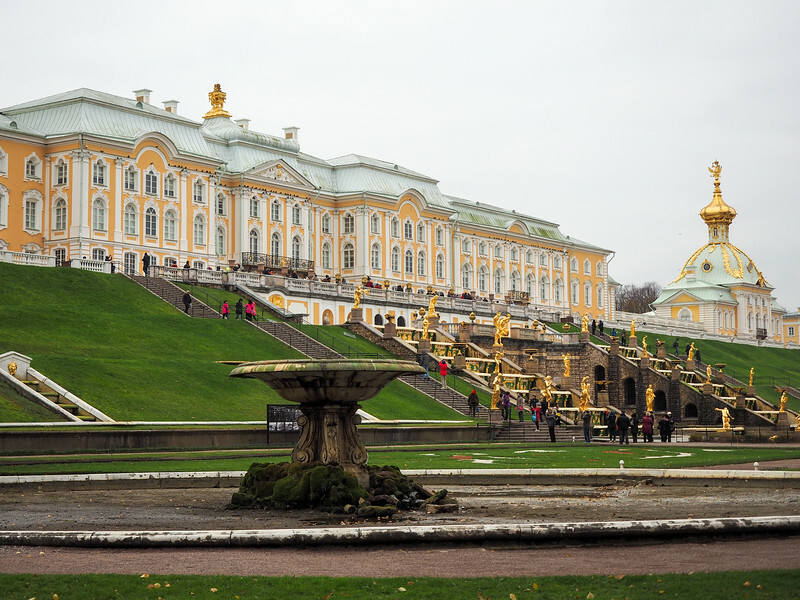 I also visited Peterhof Palace on a optional tour with Viking. This was another palace built by Peter the Great and then renovated by Empress Elizabeth (though unfortunately you can't take photos inside). This palace isn't famous for its interior, though – it's famous for its huge complex of outdoor fountains. Sadly the fountains were already turned off for the winter when I was there in late October. It was still beautiful, but it's definitely going on my list of places I need to re-visit sometime during the summer! 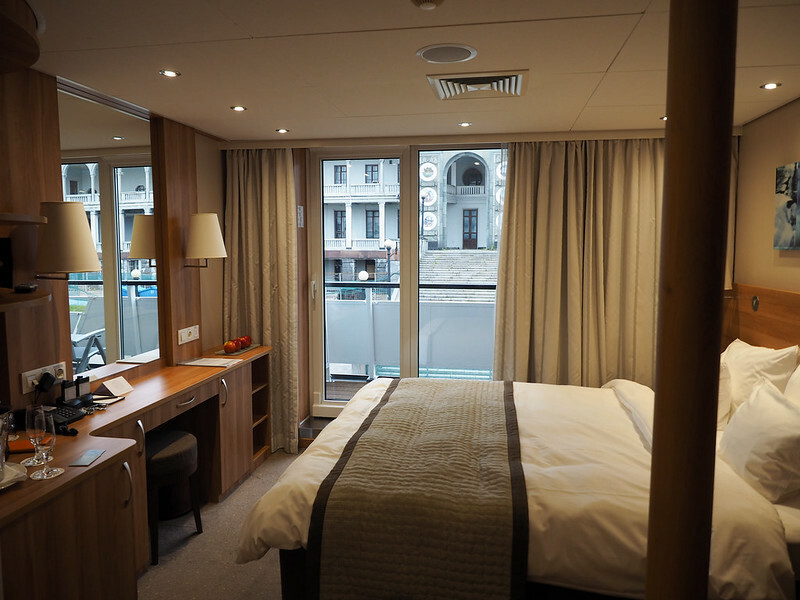 Like most Viking cruises, this “Waterways of the Tsars” cruise included comfortable state rooms, really good food, and a professional-yet-friendly staff. All the trappings of your average Viking cruises were there, including free excursions in every port (as well as extra optional tours you could pay for), free beer and wine at mealtimes, and free on-ship wifi. I booked the very last sailing of the season in mid-October (these cruises run May-October). 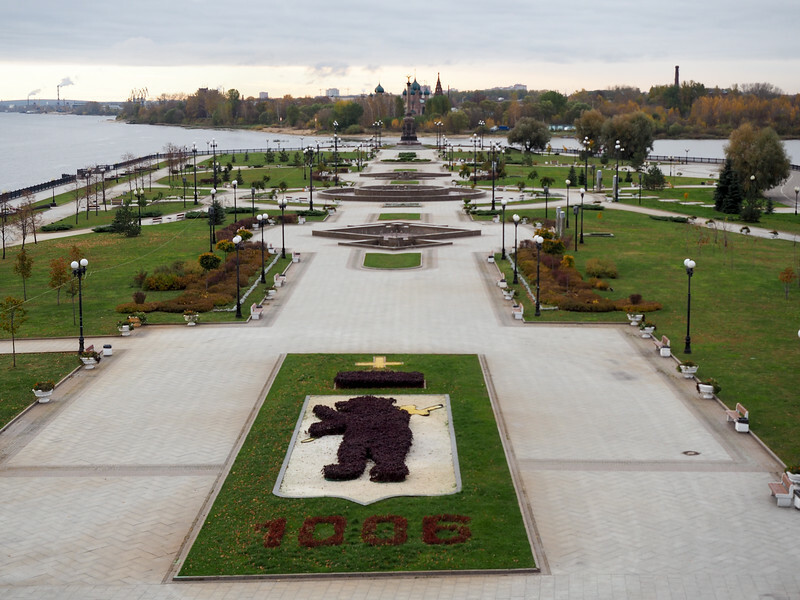 And while cruising so late in the year in Russia meant gray skies and chilly temperatures (it was in the mid-30s F most days), the advantage was a definite lack of the crushing crowds of tourists you find at the most popular spots in the summer months. For example, we were able to walk right up to da Vinci paintings in The Hermitage! If you want to avoid the largest crowds, I would suggest going either early or late in the season. 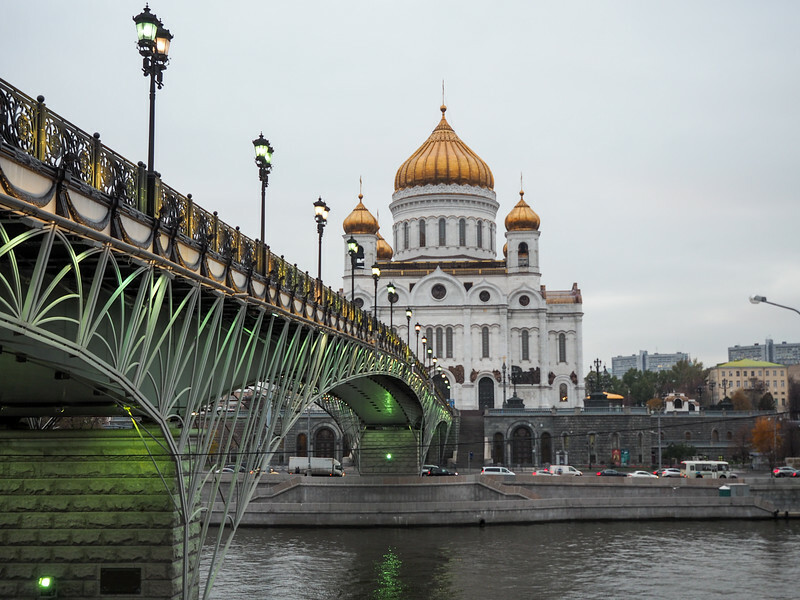 The first major difference you'll notice if you've been on any of Viking's cruises in Western Europe is that the ships in Russia are different. These aren't the purpose-built longships that Viking is known for, but rather sea-going cruise ships. The ships are slightly bigger (there were 190 passengers on my cruise), but still outfitted to the Viking standard. Another difference is in the itinerary. 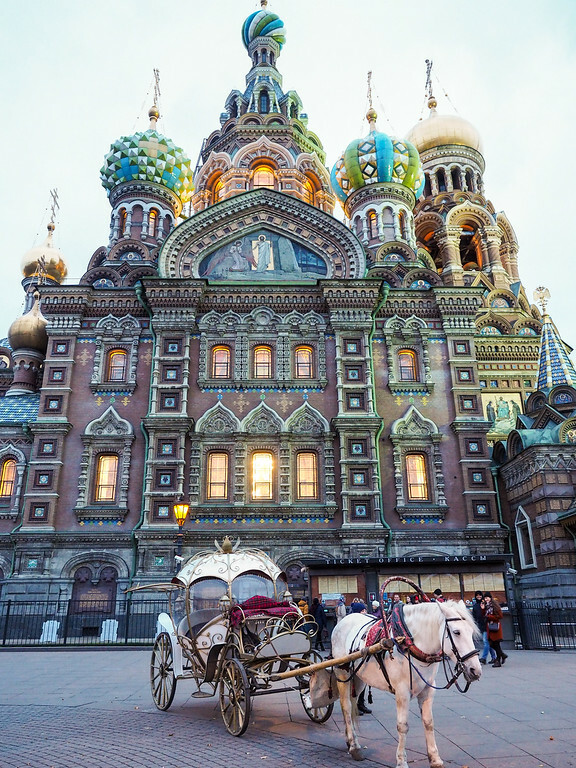 Unlike with other cruises where you spend most of the time on the move, this cruise starts with three full days in Moscow and ends with three full days in St. Petersburg. This is what initially drew me to this cruise, since it means you really do get enough time to see all the main sights. Lastly, this cruise is a little different in that there are onboard “tour escorts” that travel with you the whole time. These are local Russian guides who not only help organize excursions, but also lead tours, act as translators when you have local guides, and also give presentations on the ship on everything from Russian history to language lessons. I liked this, because it meant you got to know these guides pretty well. YES. 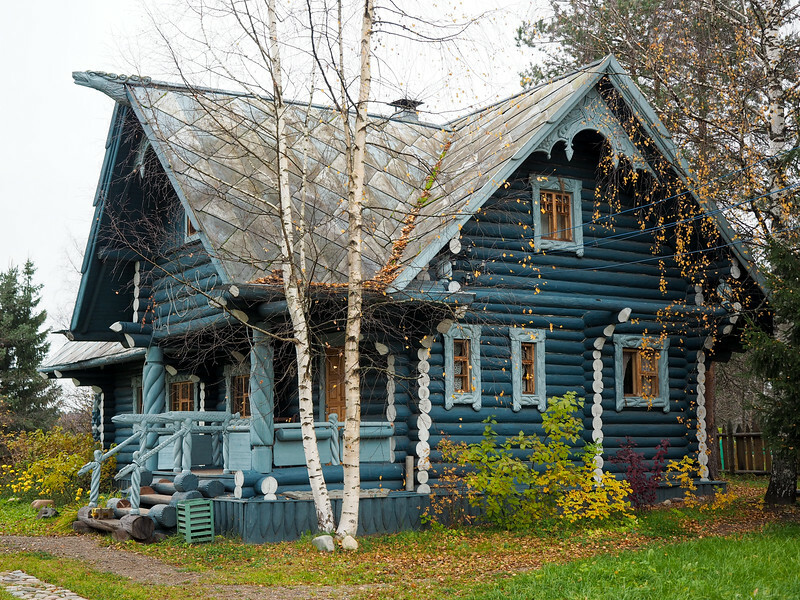 While this isn't the cheapest way to explore Russia, it's certainly one of the most stress-free. 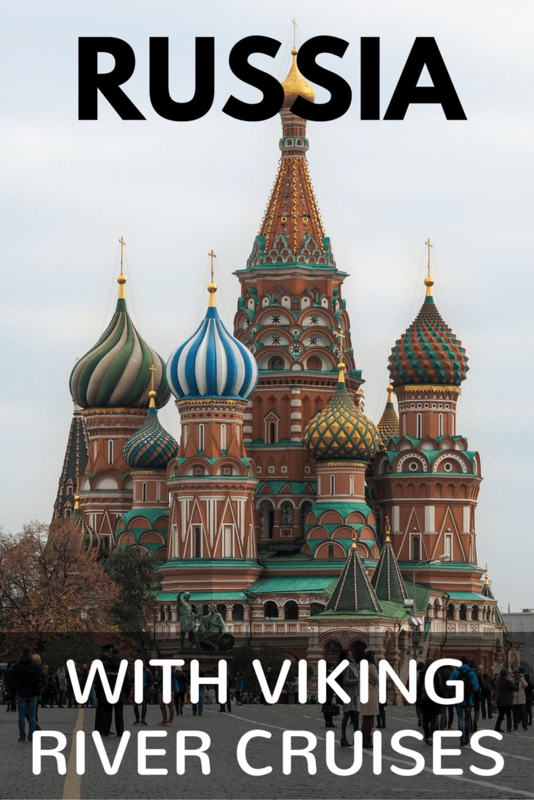 Viking takes care of all the details, and can even help you get the necessary Russian tourist visa before you go. 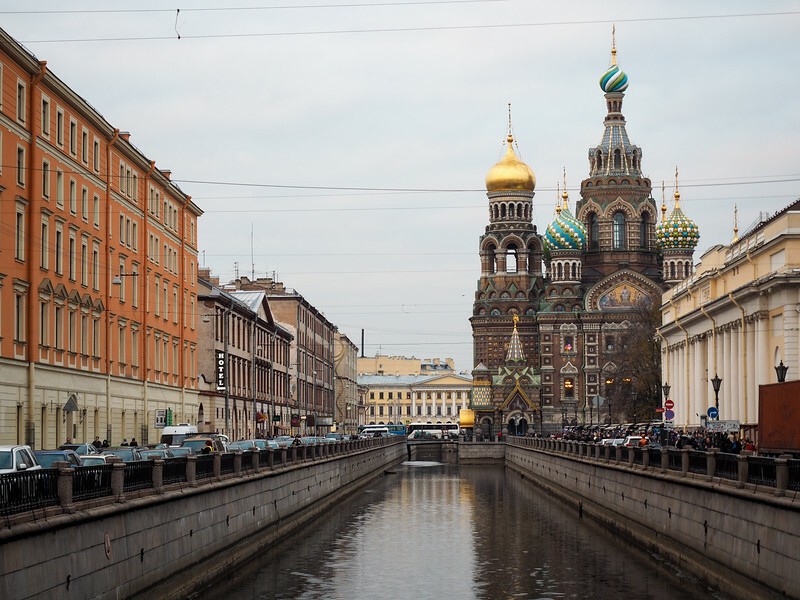 I liked the pace of the cruise, too – I packed a TON in in both Moscow and St. Petersburg, so the more leisurely sailing days were a welcome break. I should also mention that I did this cruise SOLO, and even enjoyed that aspect of it (I'll be writing all about it later!). Have you ever been to Russia? If not, would you ever consider a cruise there? *Note: I was a guest of Viking River Cruises on this trip to Russia, and received a complimentary cruise. As always, though, all opinions, photos, and gushing over churches are 100% my own. I’ve always wanted to visit Russia and this may be just the way to do it. Stunning pictures. Absolutely loved this post! Thanks, Marvin! 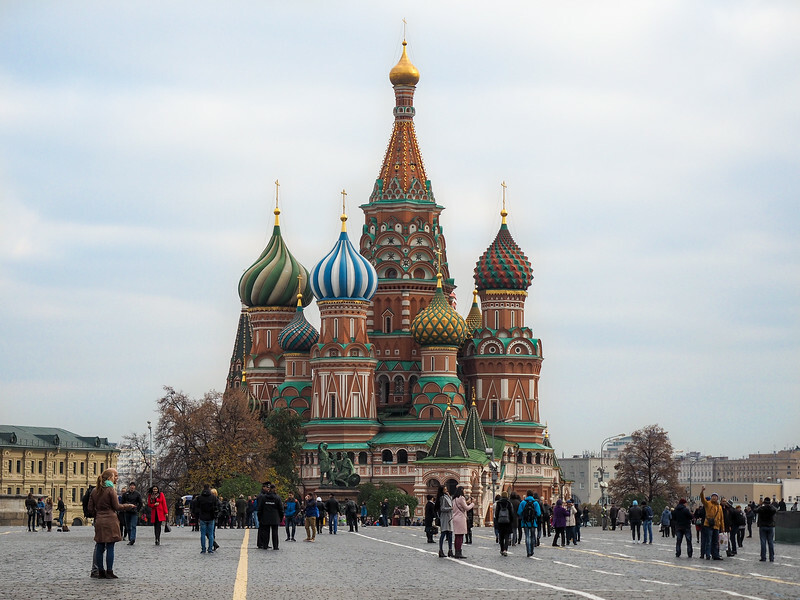 I thought it was a great way to see part of Russia – I didn’t have to worry about any of the details (or the language barrier) myself, which made for a really enjoyable trip! Gorgeous photos! I always thought Greek Orthodox churches were my favourite on the inside and outside, but I might have concluded this too early. 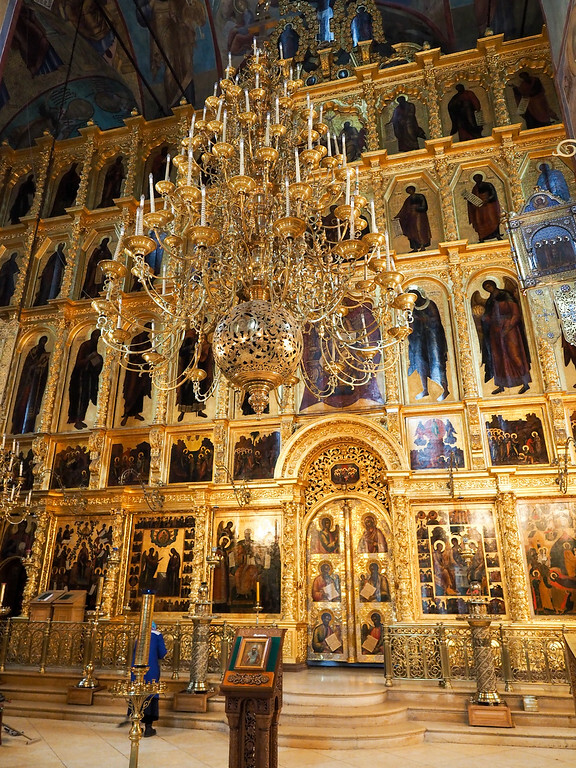 I haven’t seen the Russian Orthodox churches in real life yet, but they look quite spectacular in your photos. Is it possible? 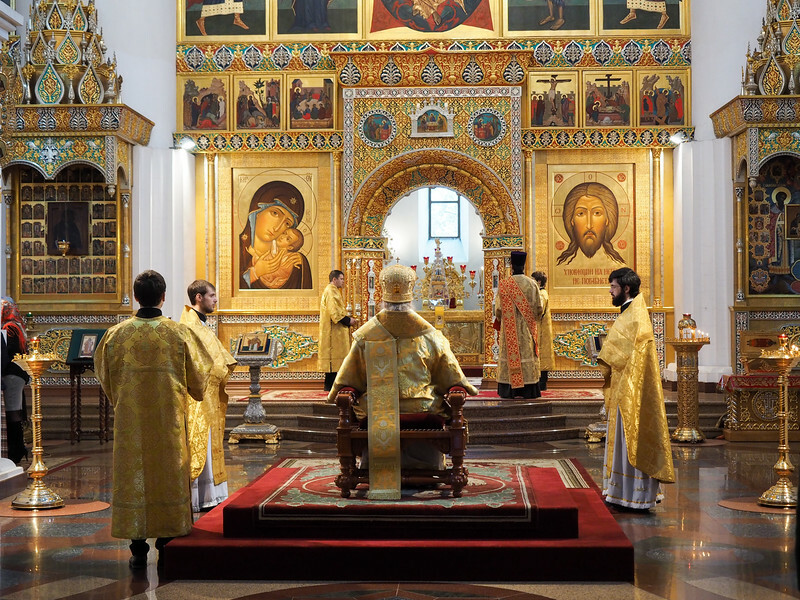 Do Greek Orthodox churches have competition? I’ll have to check the Russian ones out to decide! 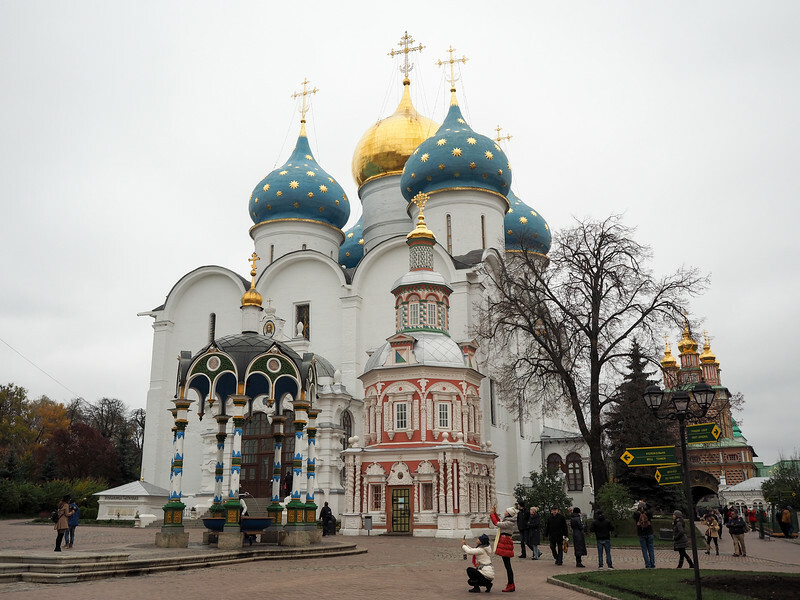 The Russian Orthodox churches I visited were certainly jaw-dropping! There are some that lost their pretty interiors during the Soviet years, but many others were preserved and/or rebuilt. Certainly a good excuse to go to Russia! I have been waiting for this post!! Wow, Russia looks like an architect’s dreamland. Plus, I didn’t know there was so much to see outside of just Moscow and St. Petersburg. Since Russia is such a big place, I think river cruising would be the best way to see a lot of Russia in a short amount of time. Is there anywhere you wish you could have spent more time? I think I easily could have spent more time in Yaroslavl (though we did see all the highlights), and I already know I want to go back to St. Petersburg again during the warmer months to see it again. 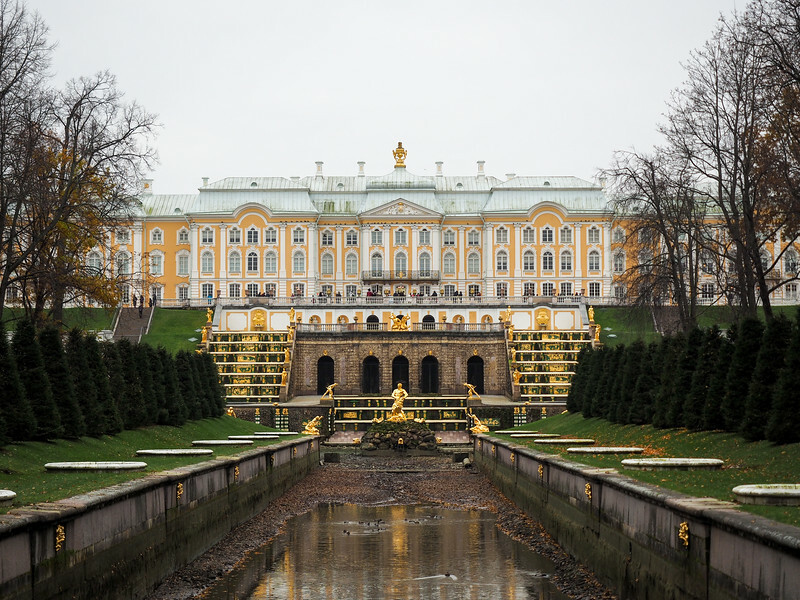 And I want to go and spend a whole day at Peterhof in the summer when the fountains are running! Seems like a really interesting way to have seen Russia! Your photographs are really beautiful – the architecture there looks incredible! Thanks for sharing your experience. 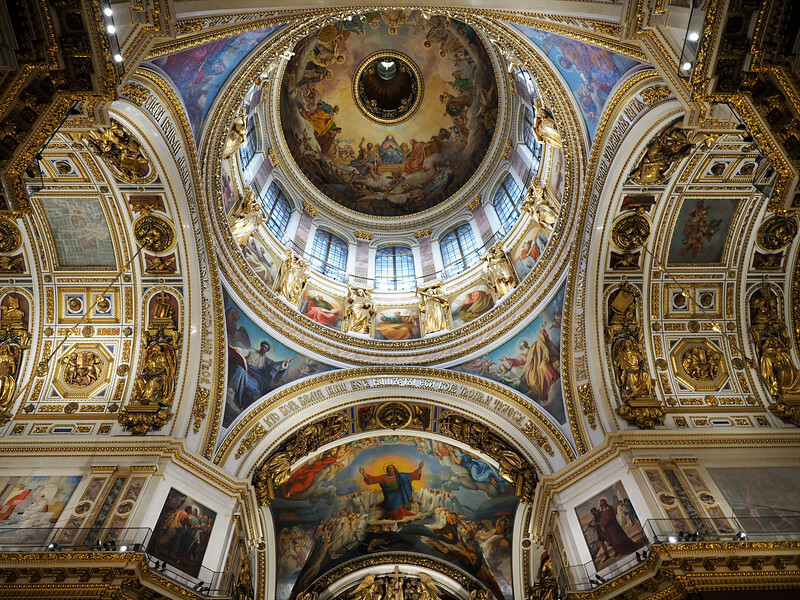 The architecture – especially in St. Petersburg and all the cathedrals – was indeed incredible. We hear so much negative stuff about Russia these days in the US that I think we forget about what a long and rich history the country has. WOW, such an awesome pics. 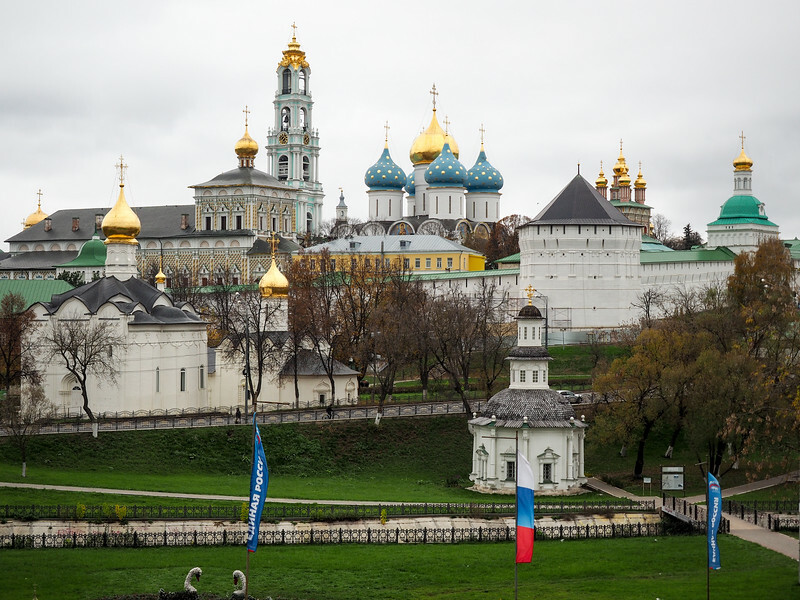 Exploring Russia with river cruises are awesome fun. Thank you for sharing. I definitely had a great time – glad you enjoyed the photos! This is such a lovely post Amanda! Russia has eluded me for many a year as I would really like to travel from Berlin to Russia by train, but I just haven’t had the time! This cruise does sound rather magnificent though as I like the fact that you spend a lot more time in destinations. These days I like to spend at least 3 days somewhere, if not 5! However, if I’ve been there many times before, then 48 hours is usually sufficient! Your photographs are smashing of course, and I do like the idea of open air musuems, the Kizhi Island, the Transfiguration Church and the Intercession Church constructed entirely of wood. Wow! I can’t believe that not a single nail was used! 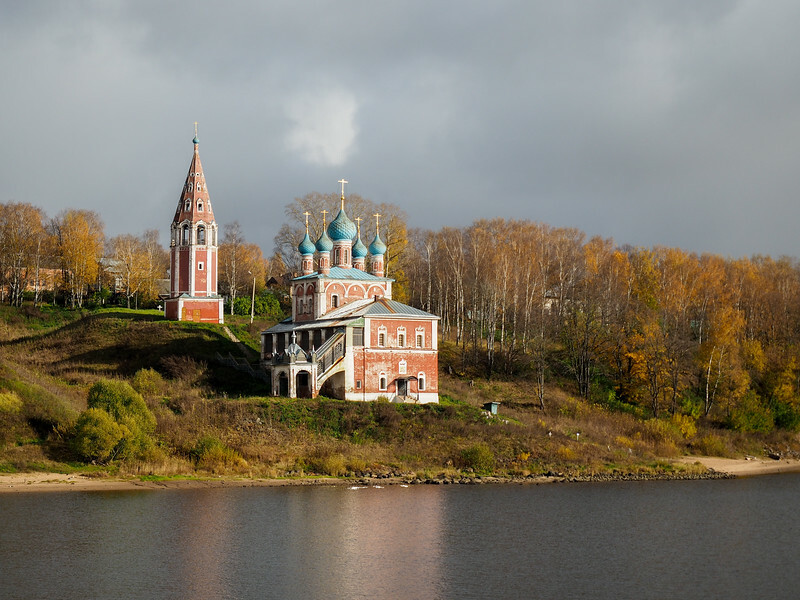 Kizhi Island was definitely a highlight – I’ve never seen anything quite like those churches! And yes, the 3 full days in both Moscow and St. Petersburg were great – I more or less was able to see/do everything I wanted to! Viking has a river cruise through Ukraine; probably not another place that people would associate for one. I really did have a great time! And Viking has cruises all over the world – they even had one in Egypt up until recently (I hope they bring it back once things settle down in that part of the world!). Beautiful pictures. I’m glad someone is traveling to Russia as it is not a common place to visit. I think a lot of people (and especially Americans) view Russia a bit negatively. 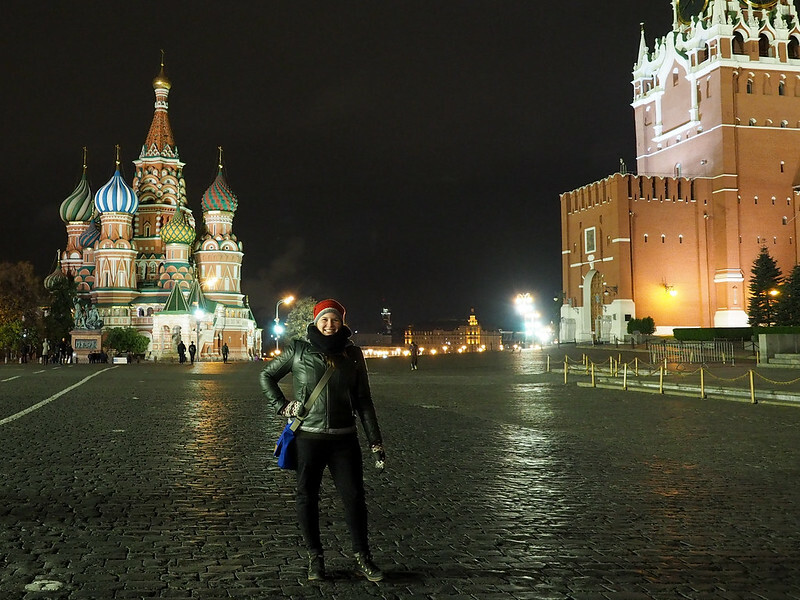 But I like going places to experience them for myself – and Russia was much cooler than I expected it to be. Amazing! I have always been intrigued, and intimidated, by visiting Russia – this seems like the perfect way to do it. Definitely bookmarking this trip for future reference! Same here! As an American, Russia is definitely made to look quite intimidating by our media. So this was a perfect way to be introduced to the country without having to worry about so many of the details. The ideal time to visit Russia is the beginning of January. You will receive a second Christmas as a gift! (Russian celebrate Christmas on January 7). I don’t know which photo(s) I love the most-but if I had to choose two, I’d probably go with the outside photo of Catherine Palace with the church peeking out from the top and The Church of Our Savior on Spilled Blood with the carriage in front of it. But they’re all striking. 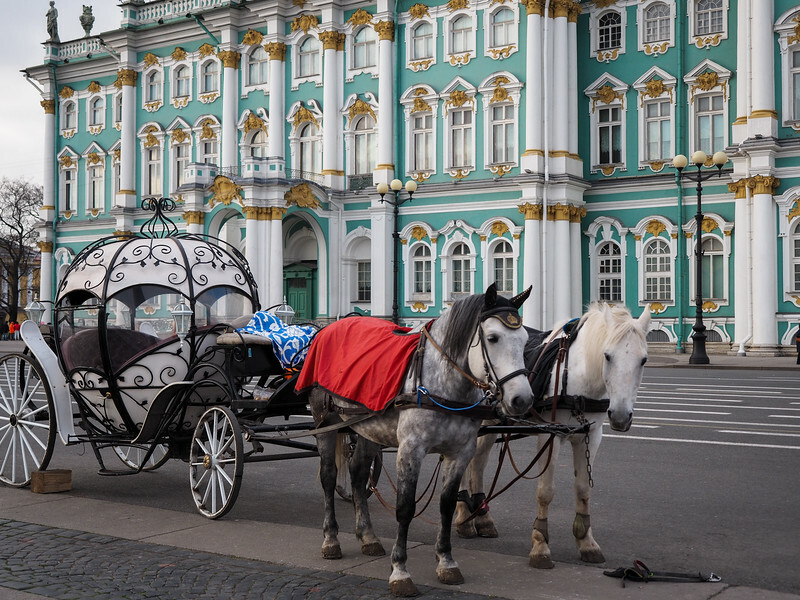 I’ve always wanted to visit St. Petersburg as I’ve been obsessed with the history of the tsars (and specifically, Anastasia Romanov) ever since I was a little girl. 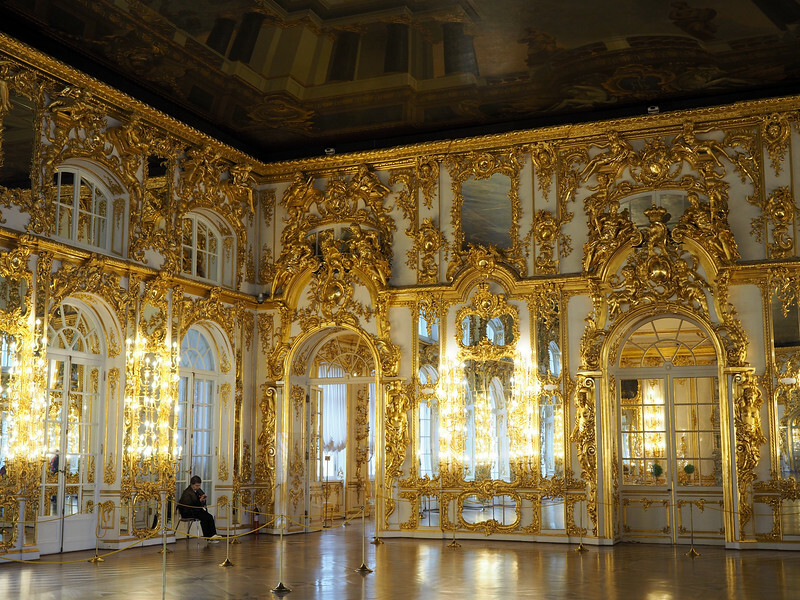 And I am a huge art fan so I’m sure I’d be in my glory at the Hermitage! 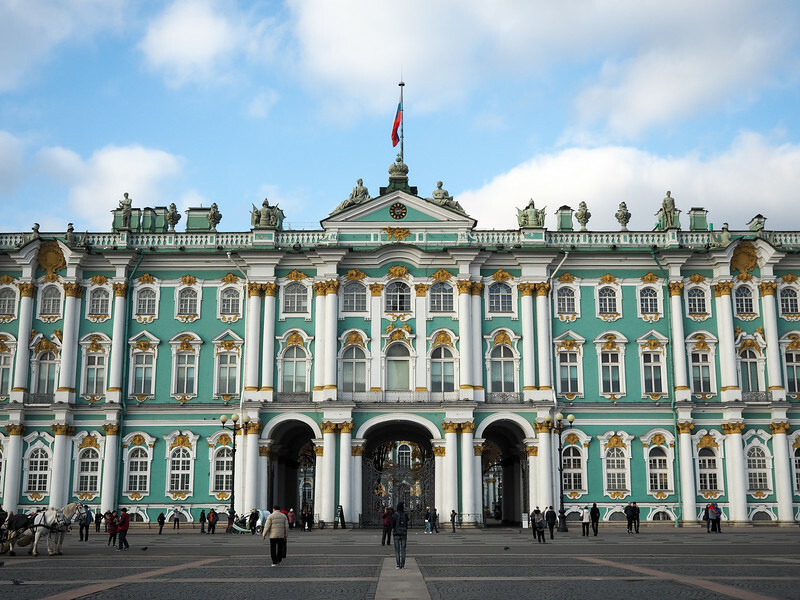 You would LOVE the Hermitage, then, because it’s got both history and art! I definitely want to go back to St. Petersburg. You have rekindled my desire to see Russia, I have been in Asia far to long! Wonderful post, very well written, and the pictures are a fantastic compliment to the text. I’m now a fan. Wonderful photos, Amanda; we, too, were pleasantly surprised by Russia. We enjoyed the sail-away parties(wrapped in warm coats and hats) on the open top deck. It was fun to have a glass of cheer, look back at the magnificent panorama of where we spent our day, and try to decide which part of the day was more memorable. That was our fifth Viking trip and one of our favorites. This was only my second trip with Viking (though my third river cruise total), and it will definitely be the most memorable one, I think! I really liked Russia, and the cruise was run so well. And it was great meeting you both! Amanda I just love your river cruise posts. You’re the only travel blogger I follow who does them. I think it’s great to read about it from a young person’s perspective. Would absolutely love to do this cruise one day, St. Petersburg looks great! Thank you, Liz! I really like river cruises, and I don’t think they’re completely out of reach for the average traveler (which is who I write for!). I definitely hope to do more in the future! Thank you so much for writing this. I was with you on that cruise and your photos have enabled me to see what I was missing by not going on some of the same tours that you did. Your words have brought back such happy memories. Like you, my wife and I are a little introverted but with Vikings non-designated seating policy we managed to strike up friendships with people from all over the world. One comment would be that you spent too much time in your cabin and not enough time tasting some of the wonderful Vodkas Russia has to offer. Thank you once again. So glad that my photos helped bring back some good memories for you, Steve! 🙂 And yes, it’s true that I didn’t drink much vodka. Maybe next time! We are taking this same cruise in June of this year. Can you please suggest an appropriate amount of local currency to have on hand. We know we can use Visa for most things, but there are always incidentals for which you need cash – snacks, shopping for small items, etc. Any advice you can offer would be greatly appreciated. I’m thinking of taking a train trip Moscow to Beijing. Could you suggest a couple of reputable touring companies. Any advise is appreciated. Really nice post! It has inspired me to hopefully cruise Russia with my family. Were there any families with teenagers on the Viking cruise? I don’t remember any teenagers on my ship, but it certainly would be a great way for your whole family to see Russia! I loved this cruise a lot. My husband and I are planning to do a Viking cruise to Russia next year. We can start either in Moscow or St Petersburg. Which do you recommend? Thanks! I started mine in Moscow, but I don’t think it makes a huge difference since you’ll still get to see everything! 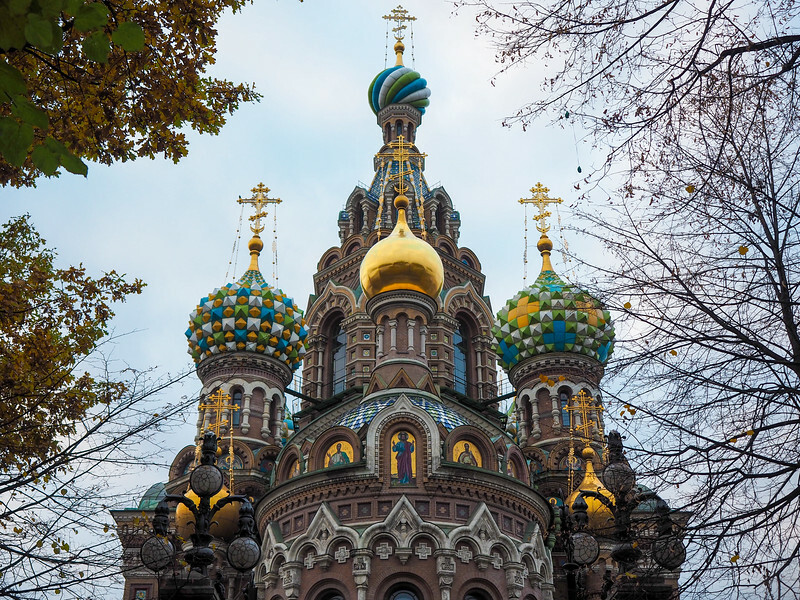 If you wanted to go a couple days early and spend some time exploring on your own, though, I’d probably choose St. Petersburg since it’s a much easier city to navigate if you don’t speak any Russian! Thanks Amanda. I saw another post from 3 years ago on another site that said the same, but for reasons of logistics and proximity of the docks to the airport. Thanks again!! Thanks for the information……great pictures!! We are cruising in August 2018 so trying to do some excursion planning. 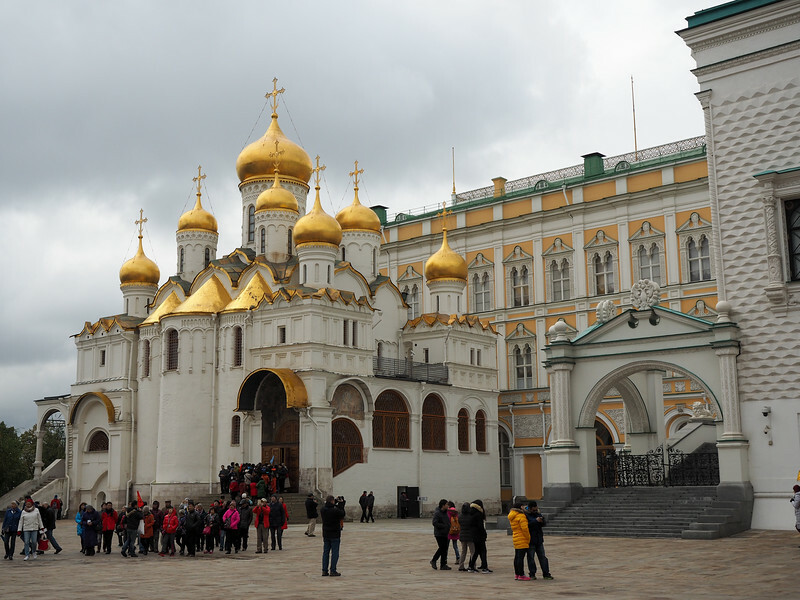 Any thoughts on the included Kremlin tour versus the optional Kremlin Armory tour? Hey Dave! The two tours are similar, except the Armory option tacks on an hour at the end to see all the treasures inside the Armory. I wasn’t going to add this portion (especially since you can’t take photos inside), but they added another group because so many people wanted to go, and so I went, too. It was actually REALLY cool! There’s so much in the Armory – clothing and carriages and all sorts of shiny treasures. But you do get rushed through a bit because of time constraints. Very nice post, thank you for sharing. We did our first river cruise with Viking this past summer, the Grand European tour and loved it. 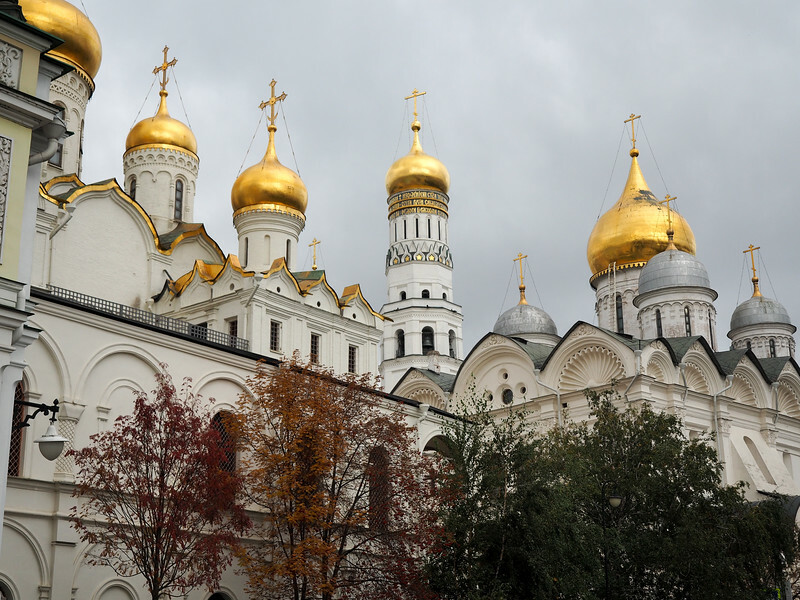 Question about the Russia tour, if one is not particularly interested in exploring church after church, being Jewish, do you think there is enough about this trip to still make it fantastic. Thank you so much. My wife and I are going on this tour in August 2018. We start in St. Petersburg and end in Moscow. Can you use cell phones on ship and in the cities or do you have to arrange for other than Verizon? Are their any secrets or tidbits you can pass on about navigating the trip, both on the ship and while on the tours? What kind of camera did you use? Those pictures are awesome. You’ll only be able to use your phone if you pay for an international “pass” from Verizon (assuming Verizon covers Russia – you’ll need to call them to ask!). The ship will have free wifi, though, so if you don’t want to pay for international coverage, you can put your phone on airplane mode and just connect to the wifi when it’s available. As for tips… I thought all the excursions were great, and definitely recommend adding on extras if you can. 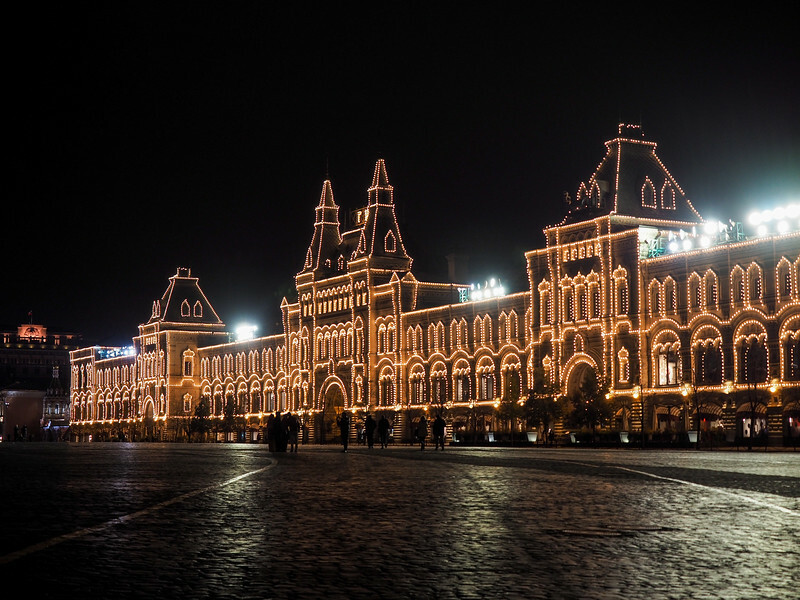 I enjoyed seeing the Armory at the Kremlin in Moscow, loved the nighttime tour that went to Red Square, and Peterhof will be amazing in the summer when the fountains are running! I also enjoyed exploring on my own in St. Petersburg. On the day we had our Hermitage tour, I also was booked to see a ballet that night. Instead of going back to the ship in between, I spent time exploring St. Petersburg on my own, which was a nice way to see things that weren’t included on some of the other tours (like St. Isaac’s!). And I shoot photos with an Olympus OM-D E-M5 Mark II! What a trip! Your blog was comprehensive and interesting. Tell me this. About how many solo travellers would you say were there? What is the average age group? Did you feel safe? Were all the included tours guided? Thank you. I hope you can reply. You HAVE inspired me to travel to Russia. ? There were very few solo travelers on this trip – I think I met one other one? Average age for river cruises is usually 65+, and I actually think the average age on this one may have been a bit older! I don’t mind that, though – I’ll make friends with anyone! I felt very safe, and yes, all the included tours included a guide and interpreter when necessary. WOW – – nice photos and a great description. We used the information provided to help select our excursions. We are going in mid-October 2018 and are very excited. You have a great writing style and the pictures are fantastic. So happy to hear this post was helpful for you! Amanda, thank you. We are going Oct. 7-19. If any one is going the same time, would like to talk to them. What stateroom were you in on the Akun? The picture looks like there is a pole next to the bed. We are thinking of doing this cruise and I would prefer no poles in Stateroom! I was in one of the Verandah rooms, though I don’t remember the exact room number. Thanks for your quick response! Was there a pole in your stateroom? Thank you for the detailed post with great pictures that gave me a sense of being there. We will have our first Vikings Danube Waltz cruise in May and your post gave me an idea for a cruise in Russia. As a photography hobbyist, I love to take night pictures and would like to ask you whether you used a tripod for those night pictures since permit is required for taking pictures in Moscow, as I understand it correctly. Is it safe to venture out at nigh without the tour group? I did not use a tripod, no – all the night photos here were just taken hand-held; the lighting at many of the popular sights is excellent at night. No photo permit required on my part – but I did go out on a nighttime tour offered by Viking and not on my own.